phenol chloroform, guanidinium thiocyanate, and cetyl-trimethyl-ammonium bromide) suitable for AFLP analysis are widely available. Because the PCR primers are not based on specific sequences, target DNA must be free from nucleic acids from other sources and hence, this method is problematic for analysis of microorganisms that cannot be grown in axenic culture or for target DNA that cannot be separated from DNA derived from extraneous sources. provides a great deal of flexibility and ''tuning'' of the number of AFLP fragments generated. Theoretically, any restriction enzyme, alone or in combination, could be used to generate DNA profiles, irrespective of the complexity and utility required. However, rarely cutting enzymes will generate few fragments, thus reducing the probability for polymorphism detection, and frequently cutting enzymes are unlikely to generate fingerprints appropriate for interpretation. 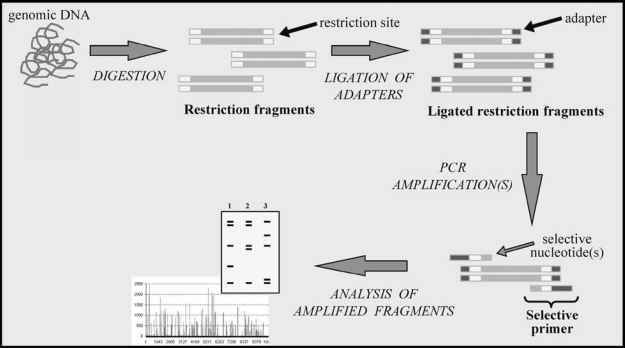 Optimal restriction digestion is fundamental for correct AFLP patterns analysis, and the original methods used a combination of two enzymes with rare and frequent cutting sites. Hence, the fragments generated contain a frequent restriction site sequence at one end, plus a rare site sequence at the other. The rationale for this choice, particularly for functional analysis of genomes with very high complexity (e.g., for plant genomes), is that only fragments with combined rare and frequent restriction sites will be amplified, thus limiting the number of selective nucleotides in primers used for subsequent am-plifications. 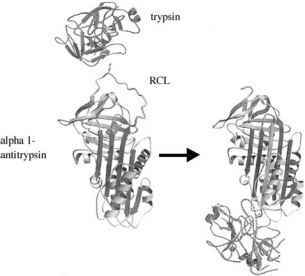 Alternative methods using only a single enzyme (sAFLP) are also available. Because the adaptors are of known DNA sequence, subsequent PCR amplification of all DNA fragments can be achieved using primers that have exact complementarity with the adaptor sequences. Alternatively, the 3' ends of the PCR primers can include one or more additional ''selective'' nucleotides, thus allowing amplification of a subset of the adapted-restricted fragments; it is usually necessary to test primers with up to three selective nucleotides to obtain satisfactory patterns. on agarose gel with ethidium bromide staining and UV transillumination/3-1 or by using fluorescently labeled primers through a polyacrylamide matrix in an automated sequencer.1-4-1 If comparisons of simple patterns of relatively low discrimination for small numbers of samples are required, these can be adequately achieved by visual inspection. However, once more complex AFLP patterns are analyzed together with the need for intralabora-tory and interlaboratory analysis, the application of bioinformatics is essential for analysis: the high repro-ducibility of AFLP supports the generation of electronic databases. A systematic review of final pattern analysis and its evaluation are outside the scope of this article; however, the fundamental aspects of DNA fingerprinting analysis as developed for other systems must be applied. In addition, the assessment of reproducibility (the repeatability of test results), typability (proportion of targets in a population that can be analyzed), and discrimination (number of different types identified) for each individual system must be evaluated, usually with a degree of empiricism.